Mortal Engines is a 2018 post-apocalyptic adventure film directed by Christian Rivers and with a screenplay by Fran Walsh, Philippa Boyens and Peter Jackson, based on the novel of the same name by Philip Reeve, and starring Hera Hilmar, Robert Sheehan, Hugo Weaving, Jihae, Ronan Raftery, Leila George, Patrick Malahide, and Stephen Lang. An American–New Zealand co-production, the film is set in a post-apocalyptic world where entire cities have been mounted on wheels and motorised, and prey on one another. Jackson purchased the rights to the book in 2009, but the film languished for several years before being officially announced in 2016. Jackson picked Rivers, who won an Academy Award for Best Visual Effects for his work on Jackson's King Kong, to make his directorial debut with the project, and also brought on several members of his production teams from the Lord of the Rings and Hobbit film series. Filming took place from April to July 2017 in New Zealand. Mortal Engines is a 2018 post-apocalyptic adventure film directed by Christian Rivers and with a screenplay by Fran Walsh, Philippa Boyens and Peter Jackson, based on the novel of the same name by Philip Reeve, and starring Hera Hilmar, Robert Sheehan, Hugo Weaving, Jihae, Ronan Raftery, Leila George, Patrick Malahide, and Stephen Lang. An American–New Zealand co-production, the film is set in a post-apocalyptic world where entire cities have been mounted on wheels and motorised, and prey on one another. Jackson purchased the rights to the book in 2009, but the film languished for several years before being officially announced in 2016. Jackson picked Rivers, who won an Academy Award for Best Visual Effects for his work on Jackson's King Kong, to make his directorial debut with the project, and also brought on several members of his production teams from the Lord of the Rings and Hobbit film series. Filming took place from April to July 2017 in New Zealand. Mortal Engines had its world premiere on November 27, 2018 in London, was theatrically released in Australia and New Zealand on December 6, 2018 and in the United States on December 14, 2018. The film received mixed reviews from critics, some of whom praised the visual effects and score with most criticizing the direction, screenplay and "lack of personality". It was a box-office bomb, grossing over $82 million worldwide against a production budget of at least $100 million. Following a cataclysmic conflict known as the Sixty Minute War, the remnants of humanity regroup and form mobile "predator" cities. Under a philosophy known as "Municipal Darwinism", larger cities hunt and absorb smaller settlements in the "Great Hunting Ground", which includes Great Britain and Continental Europe. In opposition, settlements of the "Anti-Traction League" have developed an alternative civilization consisting of "static settlements" (traditional, non-mobile cities) in Asia led by Shan Guo (formerly China), protected by the "Shield Wall". Relics of modern technology such as toasters, computers, and smartphones are valued as "Old-Tech." The city of London captures a small mining town called Salzhaken, absorbing its population and resources, under orders of Lord Mayor Magnus Crome. A masked woman among the Salzhakens is Hester Shaw, who seeks to assassinate Thaddeus Valentine, Head of the Guild of Historians. Tom Natsworthy, a teenage Apprentice Historian, is sent to London's "Gut" to collect Old-Tech for London's Museum, accompanied by Valentine's good-natured daughter Katherine. Hester attempts to kill Valentine but Tom intervenes, pursuing Hester to a waste chute. Hester escapes, but not before telling him that Valentine murdered her mother and scarred her face. When Tom informs Valentine of this, he pushes Tom down the chute. Tom and Hester are forced to work together to traverse the Great Hunting Ground, finding refuge in a town called Scuttlebug, but the owners lock them in a cell and intend to sell them as slaves. Hester confides that Valentine killed her archaeologist mother Pandora after stealing a piece of Old-Tech she found in a dig in the Dead Continent of Americas, whilst young Hester escaped with a necklace her mother gave her. Meanwhile, Valentine frees Shrike, a reanimated cyborg known as a "Stalker", from an offshore prison to hunt down and kill Hester. At the slave market of Rustwater, Tom and Hester are rescued by Anti-Traction League agent Anna Fang. During the chaos, Tom and Hester are pursued by Shrike, whom Hester reveals she knows. Hester explains that Shrike had found and raised her, and Hester promised to allow him to turn her into a Stalker like himself, but she left after discovering that London was in the Great Hunting Ground. On London, Katherine grows estranged from her father, especially after learning from Apprentice Engineer Bevis Pod that Valentine pushed Tom down the chute, and that Valentine's energy project in the re-purposed St Paul's Cathedral is more than it seems. Hester and Tom travel on Anna's airship the Jenny Haniver to the airborne city Airhaven, meeting with other members of the Anti-Traction League. Tom realizes what Pandora discovered is MEDUSA, a superweapon that can destroy cities in an instant and was used in the Sixty Minute War to destroy the world. Shrike catches up with them and Airhaven is destroyed in the ensuing fire. Following a fierce skirmish, Shrike is mortally wounded, realizing that Hester is in love with Tom. Before perishing, he makes peace with Hester and frees her of her promise. Hester, Tom, and Anna then travel to the Shield Wall with the surviving Anti-Tractionists. On London, Valentine kills Crome in a coup and drums up support from Londoners by vowing to destroy the Shield Wall with MEDUSA and lead them to a new Hunting Ground in Asia. Anna convinces Governor Kwan to launch the Anti-Tractionist fleet against London, but MEDUSA destroys the fleet and blasts a hole through the Shield Wall. Hester discovers that her mother's necklace hides a "crash drive" with a kill switch for MEDUSA. Hester, Tom, Anna, and the remaining Anti-Tractionists lead a raid against London, braving the city's anti-aircraft defences. Hester and Anna infiltrate St Paul's, and though Valentine mortally wounds Anna during a sword duel, Hester disables MEDUSA with the crash drive. Still determined to destroy the Shield Wall, Valentine orders his henchmen to kill the city's control crew and ram it into the Wall. With Katherine's help, Tom uses the Jenny Haniver to destroy London's engine. Valentine attempts to flee but Hester pursues and fights him aboard his airship, where he reminds her that he is her father. Tom rescues Hester and shoots down Valentine's ship, which is crushed by London's slowing tracks, killing Valentine. The surviving Londoners, led by Katherine, make peace with the Anti-Tractionists, whilst Tom and Hester travel in the Jenny Haniver to see the world. Robert Sheehan as Tom Natsworthy, a low-class apprentice historian of London thrown out of the city and forced to ally himself with Hester and the resistance. Jihae as Anna Fang, a pilot and leader of the Anti-Traction League, a resistance group banding against the moving cities devouring Earth's resources. Leila George as Katherine Valentine, daughter of Thaddeus Valentine and one of London's elite. Ronan Raftery as Bevis Pod, an apprentice engineer whom Katherine befriends. Patrick Malahide as Magnus Crome, the Mayor of London. Stephen Lang as Shrike, the last of an undead battalion of soldiers known as Stalkers, who were war casualties re-animated with machine parts, and Hester's guardian. Additionally, Colin Salmon plays Chudleigh Pomeroy, Tom’s historian boss; Mark Mitchinson plays Vambrace; Regé-Jean Page plays Captain Khora; Menik Gooneratne plays Sathya; Mark Hadlow plays Stigwood, the Rustwater auctioneer; Kee Chan plays Governor Kwan; Sophie Cox plays Clytie Potts; Caren Pistorius plays Pandora Shaw, Hester’s deceased mother; Leifur Sigurdarson plays Nils Lindstrom, an aviator; Aaron Jackson plays Gench; Stephen Ure plays Pewsey; Andrew Lees plays Herbert Melliphant; NFL player Michael Bennett and his wife, Pele, make uncredited cameos as two London residents; and Peter Jackson cameos as Sooty Pete. In December 2009, New Zealand filmmaker Peter Jackson was reported to have begun development of a film based on Philip Reeve's novel Mortal Engines. On October 24, 2016, production started on a feature film to be directed by Christian Rivers, marking his directorial debut. The script was written by Peter Jackson, Fran Walsh, and Philippa Boyens, while Media Rights Capital and Universal Pictures would be financing the film. Shooting was scheduled to start in March 2017 in Wellington, New Zealand. Producers Zane Weiner and Amanda Walker, who both worked on The Hobbit, spearheaded the New Zealand-based team, along with US-based Deborah Forte. In February 2017, Robert Sheehan was cast in the film for the lead role along with Ronan Raftery for a supporting role, while Hera Hilmar was cast as a female lead. In March 2017, more cast was announced including Stephen Lang, Jihae, and newcomer Leila George. Hugo Weaving, Patrick Malahide, Colin Salmon, and Regé-Jean Page joined the film in April 2017. Richard Armitage was offered a role but passed due to scheduling conflicts. Principal photography on the film began in April 2017, with shooting occurring at Stone Street Studios in Wellington, New Zealand, and was completed in July 2017. Visual effects were provided by Weta Digital and supervised by Ken McGaugh, Kevin Smith and Luke Millar. Mortal Engines had its world premiere at the Empire, Leicester Square in London on November 27, 2018. It was released in New Zealand by Universal Pictures on December 7, 2018 and was then released in the United States on December 14, 2018, in 3D, Dolby Cinema and IMAX 3D. Mortal Engines grossed $16 million in the United States and Canada, and $66.9 million in other territories, for a total worldwide gross of $82.9 million, against a production budget of at least $100 million. In the United States and Canada, Mortal Engines was released alongside Spider-Man: Into the Spider-Verse and The Mule, and was initially projected to gross $10–13 million from 3,103 theaters in its opening weekend. After making just $2.8 million on its first day (including $675,000 from Thursday night previews), weekend estimates were lowered to $7 million. It went on to debut to $7.5 million, finishing fifth at the box office. The film fell 77% in its second weekend to $1.7 million, one of the largest drops for a wide release of all-time, and finished in 13th. The film has grossed $17 million in international markets, including Russia ($4.1 million), Indonesia ($1.6 million), South Korea ($1.6 million) and Australia ($1 million). On review aggregator Rotten Tomatoes, the film holds an approval rating of 27% based on 154 reviews, and an average rating of 4.9/10. The website's critical consensus reads, "Mortal Engines has no shortage of eye-catching special effects, but lacks enough high-octane narrative fuel to give this futuristic fantasy sufficient cinematic combustion." On Metacritic, the film has a weighted average score of 44 out of 100, based on 33 critics, indicating "mixed or average reviews". Audiences polled by CinemaScore gave the film an average grade of "B−" on an A+ to F scale, while PostTrak reported filmgoers gave the film a 66% overall positive score and a "low" 43% "definite recommend"; social media monitor RelishMix noted online response to the film was "mixed, leaning negative." The Guardian's film critic Peter Bradshaw gave the film 2/5 stars, describing it as "steampunk Star Wars, with a bit of low-octane Gilliam and Gaiman on the side." Bradshaw also characterized Mortal Engines as a "tiringly frenetic and derivative fantasy-adventure movie." Similarly, The Daily Telegraph's Tim Robey awarded Mortal Engines 2/5 stars, describing the film as a "a mechanical, soulless dystopian theme park ride to nowhere." Variety reviewer Andrew Barker praised Mortal Engines's opening chase sequence but criticized the "unwieldy, baffling, exhausting, and unintentionally hysterical" plot development. While praising the film's emotional depth and Junkie XL's score, Barker compared Mortal Engines unfavorably to other science fiction films such as Cloud Atlas and Valerian and the City of a Thousand Planets. New Zealand news website Stuff reviewer Graeme Tuckett awarded 4/5 stars, praising director Christian Rivers for the film's tone, pacing, choreography, sets, and costumes while noting the film's references to other series, including Star Wars, Mad Max, and The City of Lost Children. Similarly, The Sydney Morning Herald's reviewer Sandra Hall praised Peter Jackson for his world-building and Mortal Engines's social, political, and historical commentary, awarding it 4/5 stars. The Hindustan Times's reviewer Rohan Naahar awarded the film 3/5 stars, describing Mortal Engines as a "visually, stunning adventure for kids" and praising the film's social and political subtext. IGN reviewer Rafael Motamayor awarded Mortal Engines 7.5/10 stars, praising the film's world-building and visuals while criticizing its "underwhelming" story. Motamayor also praised Stephen Lang's role as Shrike, opining that he injected "some much-needed humanity into an otherwise fully mechanical film." Ben Kenigsberg of The New York Times observed that the movie borrowed elements from other films including Star Wars, Mad Max, The Matrix, and The Lord of the Rings. David Fear of Rolling Stone described the film adaptation as "a steampunk Frankenstein's monster made from spare parts", giving it 2.5 out of five stars. Glenn Kenny of RogerEbert.com awarded the film 1.5 stars, describing the film's story pacing as "laughably portentous and kitschy" and likened the film to another box-office bomb, the Wachowskis' Jupiter Ascending. Sandy Schaffer of Screen Rant awarded the film 2.5 out of five stars, praising Mortal Engines's world design and visuals but criticizing what she termed as "its uninspired narrative and ungainly filmmaking." Philip Reeve, author of the Mortal Engines novels, praised the film, stating, "Christian Rivers has done a fantastic job - a huge, visually awesome action movie with perfect pace and a genuine emotional core... there are many changes to the characters, world, and story, but it’s still fundamentally the same thing." The film won an award for its Visual Effects, from the Visual Effects Society. At the 17th Visual Effects Society Awards on February 5, 2019, the Visual Effects team of Matthew Sandoval, James Ogle, Nick Keller, Sam Tack, were honoured in the category of Outstanding Model in a Photoreal or Animated Project for their design of the moving city of for London. While Peter Jackson stated that he is keen to develop a film series, there has been no formal announcement of plans for a sequel. When asked about the possibility of a second film, screenwriter Philippa Boyens stated that "mostly, this has to work as a film. This may be the only one... I hope not because I think the story just keeps getting better and better." In an interview with Polygon on October 30, 2018, Peter Jackson explained an absence of a game based around the Mortal Engines, saying if that film performs well enough to make a sequel, there will definitely be a video game to follow. ↑ "Junkie XL Scoring 'Mortal Engines' Movie Adaptation". Film Music Reporter. Archived from the original on 2018-06-19. Retrieved 18 June 2018. 1 2 "Film releases". Variety Insight. Archived from the original on 2018-02-05. Retrieved 2017-05-26. ↑ McCarthy, Todd (December 5, 2018). "'Mortal Engines': Film Review". The Hollywood Reporter. Retrieved December 17, 2018. ↑ "MORTAL ENGINES | British Board of Film Classification". www.bbfc.co.uk. Retrieved 2018-11-28. 1 2 D'Alessandro, Anthony (December 11, 2018). "Look Out, Here Comes 'The Spider-Verse': Sony Animation Title Eyes $30M-$35M Opening – Box Office Preview". Retrieved December 11, 2018. 1 2 "Mortal Engines (2018)". Box Office Mojo. IMDb. Retrieved February 27, 2019. ↑ "City Promotions, Events and Filming" (PDF). Heart of London. 21 October 2018. Archived (PDF) from the original on 2018-11-01. ↑ Croot, James (December 6, 2018). "Mortal Engines lacks 'personality', 'direction' say less-than-impressed critics". Stuff.co. Retrieved December 6, 2018. ↑ "Peter Jackson Shelved 'Mortal Engines' for 5 Years – Because of 'The Hobbit'". FANDOM. 2018-10-05. Archived from the original on 2018-10-09. Retrieved 2018-10-09. ↑ Chapman, Katie (December 22, 2009). "Peter Jackson to adapt sci-fi series". The Dominion Post. Archived from the original on February 23, 2013. Retrieved October 25, 2016. 1 2 Jr, Mike Fleming (October 24, 2016). "Peter Jackson & Fran Walsh Rev 'Mortal Engines'; Directing Debut For 'Hobbit' VFX Protege Christian Rivers". Deadline Hollywood. Archived from the original on 2017-05-29. Retrieved October 25, 2016. ↑ Kroll, Justin (February 2, 2017). "Peter Jackson's 'Mortal Engines' Casts Robert Sheehan, Ronan Raftery (EXCLUSIVE)". Variety. Archived from the original on 2017-06-16. Retrieved June 12, 2017. ↑ Jr, Mike Fleming (February 7, 2017). "Peter Jackson's 'Mortal Engines' Sets Hera Hilmar As Female Lead". Deadline Hollywood. Archived from the original on 2017-06-15. Retrieved June 12, 2017. ↑ Kit, Borys (March 6, 2017). "Stephen Lang, Jihae, Newcomer Leila George Join Peter Jackson's 'Mortal Engines' (Exclusive)". The Hollywood Reporter. Archived from the original on 2017-06-08. Retrieved June 12, 2017. ↑ Kroll, Justin (April 12, 2017). "Hugo Weaving Reteams With Peter Jackson on 'Mortal Engines' (EXCLUSIVE)". Variety. Archived from the original on 2017-06-16. Retrieved June 12, 2017. ↑ Kit, Borys (April 20, 2017). "Peter Jackson's 'Mortal Engines' Adds Trio (Exclusive)". The Hollywood Reporter. Archived from the original on 2017-06-06. Retrieved June 12, 2017. ↑ "Richard Armitage nearly had a Mortal Engines acting gig". www.mortalenginesmovie.com. Archived from the original on 2017-12-22. Retrieved 2017-12-18. ↑ Simich, Ricardo (April 8, 2017). "Stars arrive for Peter Jackson's hot new shoot". spy.nzherald.co.nz. Archived from the original on 2017-06-07. Retrieved June 11, 2017. ↑ "Filming begins on Peter Jackson's Mortal Engines bringing stars to Wellington". Stuff.co.nz. June 7, 2017. Retrieved June 11, 2017. ↑ "That's a wrap for Sir Peter Jackson's 'Mortal Engines', as film heads into post-production". Stuff.co.nz. July 17, 2017. Retrieved November 4, 2017. ↑ "MORTAL ENGINES - The Art of VFXThe Art of VFX". www.artofvfx.com. Retrieved 27 November 2018. ↑ "'Mortal Engines' is in UK cinemas December 8th". 2018-10-08. Archived from the original on 2018-10-09. Retrieved October 8, 2018. ↑ Yee, Lawrence (November 24, 2016). "Peter Jackson's 'Mortal Engines' to Open in December 2018". Variety. Archived from the original on 2016-11-26. Retrieved November 26, 2016. ↑ "Mortal Engines". Archived from the original on 2018-10-20. Retrieved 2018-10-20. 1 2 D'Alessandro, Anthony (December 16, 2018). "Spider-Verse' Raises $35M+ As 'The Mule' Kicks Up $17M+ In Pre-Christmas Period, But 'Mortal Engines' Breaks Down With $7M+". Deadline Hollywood. Retrieved December 16, 2018. ↑ D'Alessandro, Anthony (December 23, 2018). "'Aquaman' Grabs $67M+ Weekend For $72M+ Cume; 2018 B.O. Poised To Pass $11.4B For New Record – Early Sunday Update". Deadline Hollywood. Retrieved December 23, 2018. ↑ "Mortal Engines (2018)". Rotten Tomatoes. Retrieved December 23, 2018. ↑ "Mortal Engines reviews". Metacritic. Retrieved December 23, 2018. ↑ Bradshaw, Peter (5 December 2018). "Mortal Engines review – Peter Jackson's steampunk Star Wars stalls". The Guardian. Retrieved 11 December 2018. ↑ Robley, Tim (5 December 2018). "Mortal Engines review: a mechanical, soulless dystopian theme park ride to nowhere". The Daily Telegraph. Retrieved 11 December 2018. ↑ Barker, Andrew (5 December 2018). 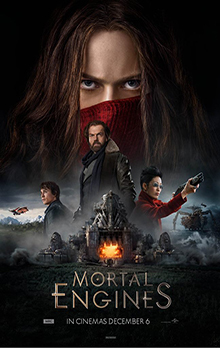 "Film Review: 'Mortal Engines'". Variety. Retrieved 11 December 2018. ↑ Tuckett, Graeme (6 December 2018). "Mortal Engines: Wondrous Kiwi-shot fantasy offers pace and style". Stuff. Retrieved 11 December 2018. ↑ Hall, Sandra (6 December 2018). "There's a lot to digest, but Peter Jackson pulls off Mortal Engines re-imagining". Sydney Morning Herald. Retrieved 11 December 2018. ↑ Naahar, Rohan (7 December 2018). "Mortal Engines movie review: Peter Jackson delivers a visually stunning spectacle". Hindustan Times. Retrieved 11 December 2018. ↑ Motamayor, Rafael (10 December 2018). "Mortal Engines Review". IGN. Retrieved 11 December 2018. ↑ Kenigsberg, Ben (13 December 2018). "'Mortal Engines' Review: London Becomes a Death Star on Wheels". The New York Times. Retrieved 8 January 2019. ↑ Fear, David (14 December 2018). "'Mortal Engines' Review: Metropocalypse Now!". Rolling Stone. Retrieved 8 January 2019. ↑ Kenny, Glenn (14 December 2018). "Mortal Engines Movie Review". RogerEbert.com. Retrieved 8 January 2019. ↑ Schaffer, Sandy (14 December 2018). "Mortal Engines Review: Peter Jackson's Mad Max is Surprisingly Bland". Screen Rant. Retrieved 8 January 2019. ↑ Reeve, Philip [@philipreeve1] (November 30, 2018). "I watched #MortalEngines twice this week, and it's brilliant. Christian Rivers has done a fantastic job - a huge, visually awesome action movie with perfect pace and a genuine emotional core. See it on the biggest screen you can. 1/1" (Tweet). Retrieved December 6, 2018 – via Twitter. ↑ Frushtick, Russ (30 October 2018). "Peter Jackson on Fallout, Far Cry and his future in video game movies". Polygon. ↑ Ray, Jeremy (3 December 2018). "The 'Mortal Engines' Cast Has Ideas for Its Videogame". FANDOM.